If you no longer can or want to wear heels, there are many lovely options offered in flat shoes. The look for today is one that I would wear out to dinner, to a party in someone’s home or other social function such as a play or musical performance during the holidays. The crystal earrings are by Ralph Lauren. Similar earrings here. I am very strategic with my placement of “bling”. If I wear any rhinestones at all, there are only one or two pieces. The dome ring here and the earrings are enough. Bright silver items such as the link bracelet (similar here) can have just as much impact, without looking like I have worn every piece from my grandmother’s jewelry box. My velvet smoking slippers are by Tommy Hilfiger. Materials such as velvet, satin, brocade or metallic leather make footwear more special for the evening. If you are wearing a shimmering dress or top, keep the shoes on the plain side. If your outfit is rather simple, you can wear more ornate shoes. Wearing both creates a visual overload. Other smoking slipper options are found here. As I age, my feet are less attractive, so I now avoid shoes that say “Look Here!”. When I wear shoes that show the top of the foot, I never wear socks or opaque tights; instead I choose sheer silky pantyhose. I never wear trouser socks or knee highs because the band always shows through pants. In warm weather, I wear these shoes with Sheec no-show socks found here. Sheecs are the only no-show socks (shown below) I have ever worn that stay in place. When wearing a long top or jacket, I balance the look with slim fitting pants or leggings. The beautiful long jacket is by Lior Paris and the liquid leather leggings are by Clara Sunwoo here. Both are from my friends at My Fair Lady. They are having a 20% off sale with free shipping today through Monday! Sparkle18 is the code. The gray satin camisole was from Express last year. Similar here. Another styling tip, I always belt a loose fitting long first layer to define the waist. The hook style belt is old from Chico’s. Similar here. The clutch is also a few years old. Similar bag here. Love your blog. You have a glow. What foundation do you use? I am not wearing foundation. I use only Beautycounter skin care products (here). I also do not eat processed foods or pork or beef. I just ordered these no show socks and hope they work with my feet also. BTW, what tips do you have for pierced ears where the hole drags down with heavier earnings. I purchased some “patches” that go on the back of my ears but they only marginally help and are very difficult to affix. Thanks! I only wear earrings that have posts or otherwise cover the hole. I avoid wires. Try clips instead of pierced when you want to wear larger heavy earrings. 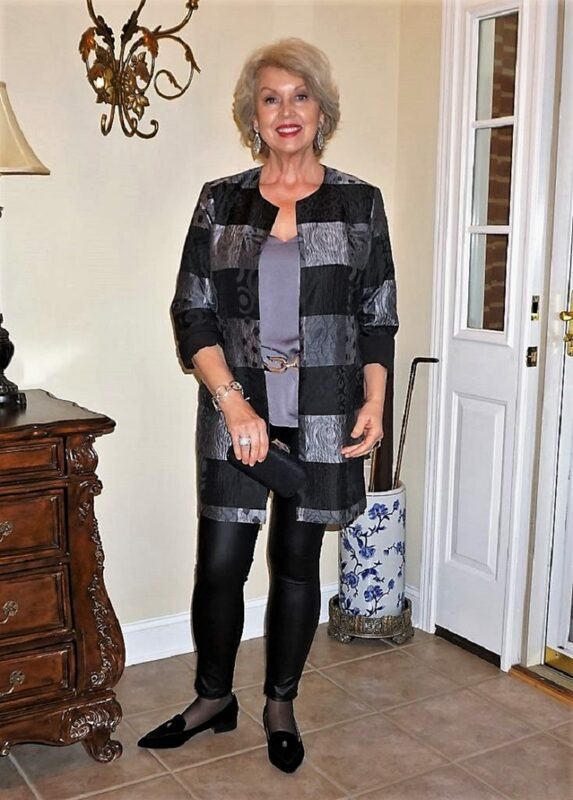 As a 59 year old teacher, I also love to wear beautiful flats! Talbots has many beautiful, comfortable flat styles every season! I enjoy reading your blog, admiring your lovely outfits, and viewing the photos from your excursions! Thank you for your great advice and insights also. May you and Mr. Mickey have a wonderful holiday season! Great information that is very helpful in wearing flat shoes! Thank you. Thank you so much for the no show sock link. I’ve tried several brands and none of them are as concealed as the Sheec’s. I think they would make a great stocking stuffer for the gals in my family this Christmas too! I love the soft shoes you wear – they would be great to tote along everywhere I go. As a Canadian, our habit is to leave our shoes at the door, even contractors. I live in London, Ontario and even the medical offices (winter only) require you to remove your shoes as you enter. They do provide slippers at the door, but it is considered a faux pas to walk in our homes, offices or schools without changing shoes. Schools require children to have (2 pairs) indoor/outdoor shoes all year round. I have an armoire in my front hallway with guest slippers for this reason. Your light shoes are an inspiration for me to step up my game and look for shoes with more panache. Thanks again! I do not like to wear street shoes inside either. I know others feel as we do, so I added the attractive house shoes to my shopping site. Smart holiday/special occasion look without having to wear killer heels. Thanks for such a great blog. I love this look. Also, I rarely wear heels any more so this was timely. Seems you are always writing about what I need. Just got 2 scarves that I ordered AND a free one! How did you know wpexactly what color I needed?! Thanks so much. They are all lovely. Can’t decide which one to wear first. Lovely shoes Susan. I wonder when the sky high stilletto will leave the scene? I very much enjoy your blog — I am 82, and I still care very much about how I present myself. It seems that you and I choose similar items! Although I retired from teaching French and English in high school, my first job out of college was with the Buyer Training Program at Neiman Marcus in Dallas. 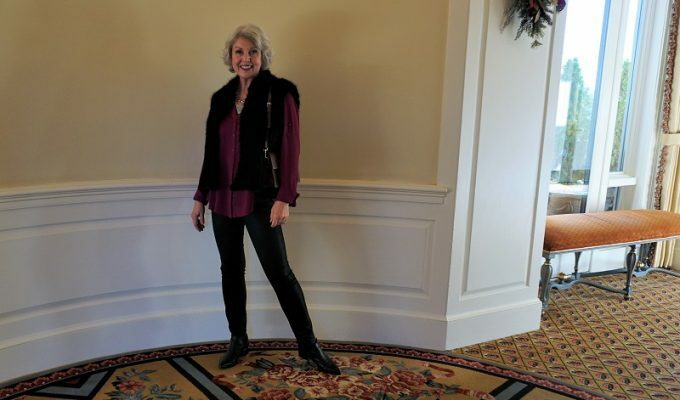 RE: today’s blog, rather than the leggings, I would choose my black, very slim leg pants from Chico’s, in a fabric called Magique, which present the same silhouette as the leggings. Since my shoes must be in a narrow width, I cannot order the shoes you feature. A good substitute for high heels for my narrow feet: Cobb Hill by Rockport. I have several pairs of these shoes in a style called AUBREY. If you wish, you can check these out online. I usually wear sheer, black knee high hose with these shoes. With Chico’s Magique fabric, the outline of the hose does not show through the very slim leg pants! Yea! Cynthia — originally from Tennessee: graduated from college in Texas — in Michigan for 50+ years! Thank you for showing a lovely outfit with flats. I no longer wear heels & appreciate you demonstrating how we can look stylish with flats. Sorry Linda from London ON but I am Canadian and I have never heard of being required to remove footwear upon entering doctor’s offices, hospitals, offices, etc. Where would you ever get the idea that it was faux pas? They are public places not our private homes. Yes, schools require two pair of runners in order to keep the floors clean. And, many remove shoes upon entering their homes, as do I. But I know of many that wear footwear in their homes as hardwood floors are hard on the feet. Once again, I am sorry to take issue with your comment but it is misleading. I love the pointed toe on your flats, I find a pointed or almond-shaped toe much more flattering and elegant than a rounded one. I note also that you are wearing a belt under your jacket. That’s a great idea for those of us who no longer have the well-defined waist of youth. It hints that the waist is still there! Fabulous and inspirational as always, Susan! Appreciate the shoe tips. Not your usual look with the busy pattern and bold stripes, as well as the shiny leggings. Don’t believe I could carry it off. But I get the overall wider over slim proportion. Thanks for the referral for Shee no socks! As I’m pulling up my “no socks”, I’ll be heading on over to the website! I LOVE the jacket! As for shoes, I’m taller than my husband and I’ve never found anything higher than a kitten heel particularly comfortable, so I’m delighted that there are so many dressy flats available these days. Once again thank you I love your blog and it helps me when I dress as I only wear slacks etc. Joanna, Linda does not say that hospitals require a shoe change, just doctors’ offices. I agree with her observations. Why would you make it a point to contradict her? It is considered polite to remove your outdoor shoes in homes that I visit. Most polite Canadians bring slippers or indoor shoes along to wear. Susan, your shoes are perfect for a dressy style. Thank you for all you do for us. May you and Mr. Mickey and your families have a wonderful holiday season. Enjoyed the “tour” of your closet! Just wondering how you store your many scarves? I have a couple from you and love them! I blogged about storing my scarves here.